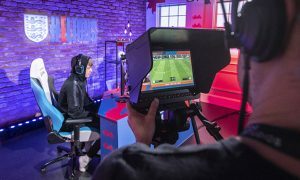 With London set to host the inaugural FIFA eNations Cup from 13 to 14 April, the Football Association (FA) found itself with just six weeks to pull together an eSports competition that would decide the composition of England’s first eLions line-up. Esmond Blake, senior manager for commercial strategy at The FA, has been looking into the feasibility of an England eSports team over the last six months, so the area has been on the FA’s radar for some time. The FA has waited for the perfect opportunity to get into the game. Damien Cullen, senior video manager at The FA, told SVG Europe: “We’re always trying to find ways to be innovative. The FA wanted to own its entry into eSports. “FIFA sent an invite six weeks ago asking if we wanted to take part [in the FIFA eNations Cup]. From there, we quickly looked at whether we wanted to outsource this broadcast or own it, and we decided we wanted to own it, while collaborating on the project with ESL. It seemed like a good point in time to [get the FA into eSports]. It was a great opportunity,” added Cullen. On 1 February 2019 FIFA invited the FA to put forward a team, launching Cullen into action to put together an eSports event to find the two champions to go forward on England’s behalf with the clock ticking. FIFA’s deadline for submitting a team was 31 March, however The FA made the decision that if it wanted to do a broadcast, it was best to do it before the men’s senior team met up on 17 March. Cullen went first to Alex Pettitt, technical consultant for the FA’s video team, who he had first worked with on the FA’s Lions’ Den daily show, which was exclusively live from the England camp in Russia during the 2018 FIFA World Cup. “The key to this was Alex, and a central London studio,” notes Cullen. The biggest challenge for this project was time, Pettitt says: “This came to us late in the day on a very tight turnaround. But I knew even though time was tight, it was doable.” The first conversation between Cullen and Pettitt was on 26 February, and their first face to face meeting about it was the next day. 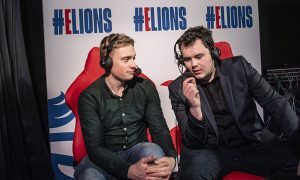 While The FA handled the look and feel of the final tournament to find the ultimate eLion champions, Pettitt notes that the first question he had faced was whether to build a custom studio at Wembley for the day of competing to find England’s eLions, or to find a studio in London that The FA could work with. Due to time restraints, the latter was decided upon as the plan of action and the team found TOG Studios, a fully flexible, all-inclusive production studio based in Marylebone, London. On Thursday 14 March, England’s first eLions were confirmed after a day of tense gaming at TOG Studios. 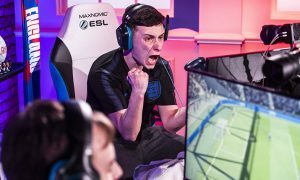 Ultimately, Donovan ‘F2Tekkz’ Hunt (number one player in the world,) and Tom Leese (from the online qualifiers,) won on the Xbox One and PS4 categories respectively to become England’s first eLions. The two winners will be official England players until July 2020. Viewing figures for the eLions tournament were consistently around 450 to 800 viewers at any one time, says Cullen. FIFA has now confirmed the full line up of participating countries that will compete at the first-ever FIFA eNations Cup. As one of the major events in the EA Sports FIFA 19 Global Series, the FIFA eNations Cup is a new addition by FIFA to this season’s professional eFootball calendar and will feature 20 national teams from all six confederations (Concacaf, CONMEBOL, CAF, OFC, AFC and UEFA). In addition to international glory and a prize pool of $100,000 at stake for the teams, players selected by their member association for the FIFA eNations Cup 2019 will also have the chance to win up to 1,500 EA Sports FIFA 19 Global Series points, providing them with an opportunity to move up the FIFA 19 Global Series Rankings and take a step forward on the Road to the FIFA eWorld Cup 2019 in August this year. Following a thorough and extensive evaluation and invitation process conducted by FIFA for the inaugural event, the 20 countries confirmed to participate in the FIFA eNations Cup 2019 are: Argentina; Australia; Brazil; China PR; Denmark; England (host country); Finland; France; Germany; Mexico; Netherlands; New Zealand; Norway; Portugal; Saudi Arabia; South Africa; Spain; Sweden; Russia; US. In addition, London has also been confirmed by FIFA as host and the tournament will be broadcast by the Media Rights Licensees for the event. It will also be streamed live across FIFA’s digital channels on 13 and 14 April 2019. Christian Volk, director of eFootball and gaming at FIFA, said: “With 20 of the world’s best eFootball nations going head-to-head, this year’s inaugural FIFA eNations Cup will provide another great example of the passion and excitement that eFootball has to offer, as well as providing the chance for players and member associations to compete for national pride and international glory.